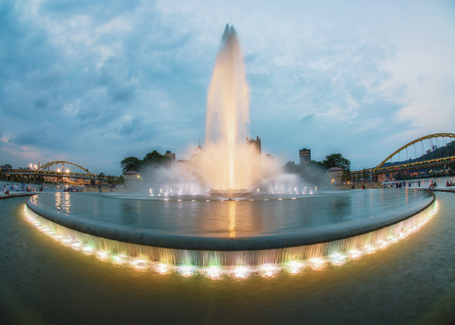 The Point State Park Fountain, dedicated by the Commonwealth of Pennsylvania in 1974, is an iconic landmark of Pittsburgh and is located right at the tip of downtown, at the “point” where the Allegheny and Monongahela rivers meet to form the Ohio River. It is located in Point State Park, a national historic landmark hosting more than three million visitors annually. In 2009, the fountain was closed for extensive renovations due to equipment deficiencies. The $11.6 million fountain project took six years to complete and was its first major overhaul in almost 40 years. The renovation was supported by a combination of state funds as well as business and private donations. Infinity edge waterfall which visually connects the pool at the fountain’s base with the rivers’ confluence to appear as one continuing body of water.